"A good plate of Nasi Lemak is about getting the basics right. It is not about adding good side-dishes or adding expensive gourmet ingredients." This is one of those "public cooking notes," where I had to jot down notes after cooking a good dish and you get to read it. It was a wonderful day of celebrating the 50th birthday of our nation. Being a Sunday, it started with worship in church where we prayed together a prayer of thanksgiving. Then families gathered to watch the NDP together in the evening. What should we serve for dinner? We decided on Nasi Lemak and indeed, it was the right choice. Both Malay and Nonya at the same time, this dish which originated in Malay seaside villages has evolved in our multicultural city to what it is today. In fact, there are many versions of it, from the simple and essential, to those that come served with many side dishes. The versions I cooked today started out as an Auntie Ruby version. It comes with a very good chilli and the mandatory hard-boiled egg. She will normally serve it with beef rendang or curry chicken. I have strove to improve on it and as it is a popular party dishes, as the say, practice make perfect. It is always offered at the Alpha Introductory Dinners at my previous church (St James' Church) and I had the opportunity to try out different combinations. I should say "we" because my dear friend Auntie Lucy and her helper Faye also worked closely with me to critique and improve on it. From Auntie Lucy, I learned how to steam the rice and the importance of using fresh coconut milk instead of packet ones. We also discovered that frying the rice beforehand improves on the texture. In fact, every "component" of this dish has been worked at. Here is the thing: A good plate of Nasi Lemak is about getting the basics right. It is not about adding good side-dishesor use expensive ingredients. Get the essentials done right - nasi, sambal, anchovies, egg, peanuts, cucumber - work at it and you will always have happy diners of your version. If you look at this list, actually what you need to focus on is the coconut rice and the sambal. From my experience and evaluation with my "Nasi Lemak Team," we find that seeing an additional curry dish, i..e Beef Rending, Curry Chicken or Sayur Lodeh distracts and affect the balance of a good NL dish. Not that you cannot offer them as side dishes but the essential Nasi Lemak needs to be done well. I prefer to add Ayam Goreng and Assam Prawns for the protein (links to recipes below). 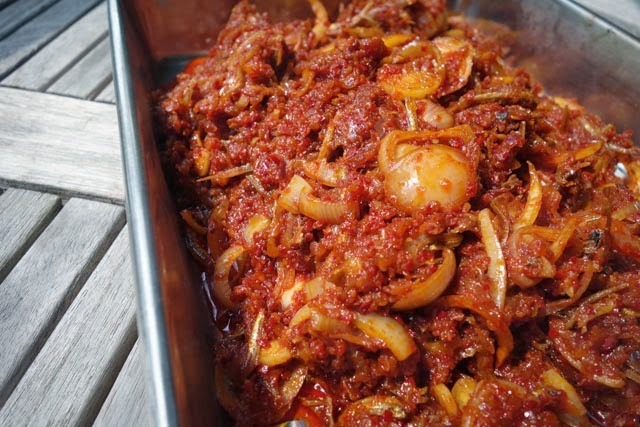 As for Sambal, sometimes I add the anchovies or some prawns in. I have done various posts explaining in detail how to do these well and I need not repeat it here. Sambal - Use oil leftover from frying Ikan bilis for the umami. Sweat the blended onions. Add Gula Melaka and salt. Towards the end, add slices of large red onions. Coconut rice - Use freshly squeezed coconut milk, pandan leaves (fragrance - smell), salt (flavour - taste buds) an get the rice texture right (the al dente bite). If you can, steam it. Go to link for details. I will sometimes use basmati rice. Ikan bilis - Buy the better variety which is not too salty. Sun or dry it (fridge, light microwave) before deep frying to ensure crispiness. Peanuts - Use the smaller and tastier variety. Coat in a bit of oil (so that it will not burn) and toast in wok. Hard-boiled eggs - Don't overcook. Check NL posts for details.